When you visit a donut shop for the very first time, you can't help but want to try everything, so that's exactly what I did, thanks to the good folks over at Johnny Doughnuts. What started as a food truck, grew into a storefront in San Rafael, and now with a beautiful space right here in Hayes Valley, Johnny Doughnuts is a local city gem dominating the donut game. Its newest spot sits between Fulton and Gough. A bright and inviting space, walk in and your eyes go directly to the variety of donuts stacked on rustic boards and perfectly presented on cake stands. With a recipe setting itself apart from other donut spots, Johnny Doughnuts isn’t your average mom and pop corner shop. Handmade from a Southern 1920s recipe using fresh potatoes and organic flour, these doughnuts pack a punch and are a helluva lot more satisfying. The potato is what gives the doughnut its dense texture, so it's chewier and you get a lot more bite. I tasted an assortment of flavors from classic glaze to lime poppyseed. The homemade glazes weren't too sweet, not too rich either. It's exactly what you want to satisfy a sugar craving. My absolute favorite was the lime poppyseed. There's a slight tang in the lime glaze, but it wasn't too overpowering at all, and though you see a lot of the poppyseed, you just taste a hint of that, too. The two ingredients surprisingly compliment each other. It was so delicious. How did you come across this doughnut recipe from the 1920s? The Owner, Craig Blum, researched doughnut recipes for two years with his lead pastry chef. They stumbled across it together. What was it about the doughnut that made you want to turn it into business? 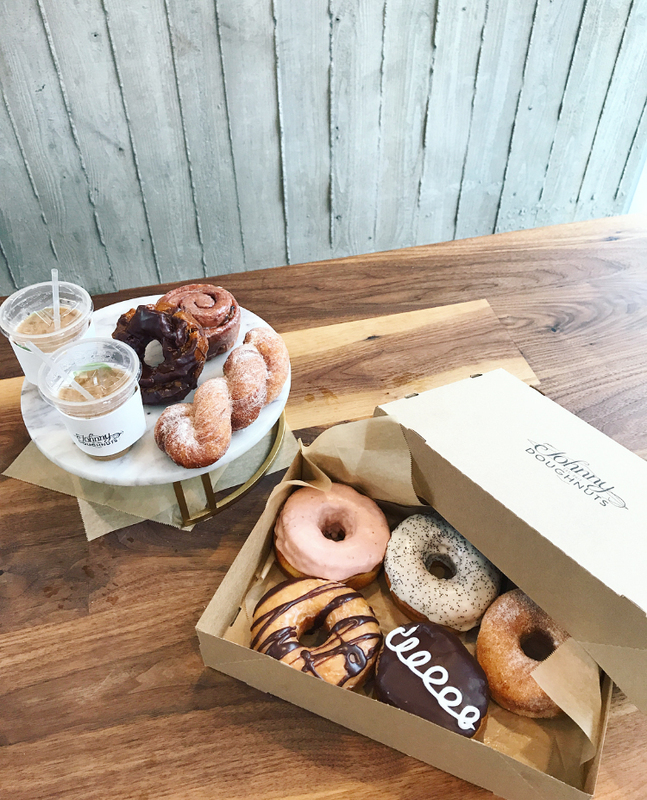 The whole idea of Johnny Doughnuts was to create a space where people can come together and form community, a product that is delicious, nostalgic, and something that isn't being done anywhere else. We wanted to create a product for treat seekers and the food trucks allow us to cater to different communities throughout the Bay Area! Spreading the love! For someone visiting Johnny Doughnuts for the very first time, what flavor would you recommend? Oh my gosh! Hardest question to answer. We always want to understand what that individual customer prefers, then we develop the conversation from there. We want to individually guide the customer through our variety to pick the utmost choice for their liking. I always urge them to try two different ones to see the difference in doughs! What was the inspiration behind some of your more unique flavors like the lime poppyseed and caramel apple fritter? The inspiration flares from the seasons, however those two particular choices stayed for the years duration due to the popularity! I think the freshness of adding lime juice and zest into the sweet dough perfected the tart and sweet combination! For the apple fritter, it was the idea of sticking with something tradition and adding a pop of something modern and different-carmelizing the apples in a house made Carmel! How do you stay relevant in a city that's constantly evolving when it comes to food? We stick to what we know. We do doughnuts and we do them well. We are trying to amp up our seasonal flavors more so! We are different than all the other doughnut shops that have been around for ever. We are changing the entire thought behind a doughnut. With all of our ingredients being fresh and from scratch, we standout from 80% of all other doughnut shops. Use one word to describe Johnny Doughnuts. A few different one worders: homemade, handcrafted, special. Johnny Doughnuts brings a new twist to a fun treat we know, love, and find comfort in. Have your doughnut of choice with a hot cup of its Equator coffee for the ideal pairing.